Yay! It's my birthday! I LOVE my birthday!! You know what else I love? CHOCOLATE. Chocolate and my birthday go together like...well ya know...like stuff that goes together. Up until now I hadn't had the opportunity to try Divine chocolate, although I have seen it in multiple stores in the city, (such as the one on 1066 Third Avenue, near my favorite Bed Bath and Beyond location--check out their store locator to find where YOU can get some Divine chocolate. ), so I was STOKED to be sent such an amazing array of chocolatey goodness! Divine provided me with their baking line as well as their super festive holiday goodies! So far, everything has been just luscious-I cannot wait to try out everything! AND, on top of delicious chocolate products, Divine also has an incredible story. Grown in Ghana, the cocoa beans used by Divine Chocolate are hand-harvested, slow-fermented and carefully dried by the family farmers of the Kuapa Kokoo Farmers Cooperative, who co-own the company. While Fair Trade makes sure farmers get a better deal for their cocoa and some extra income to invest in their community, company ownership gives farmers a share of Divine’s profits and a stronger voice in the cocoa industry. HOW COOL is that??! For more info. about Divine Chocolate, visit www.divinechocolate.com/us. For news about competitions, deals, and more, sign up for the Divine Newsletter: http://www.divinechocolate.com/us/subscribe-our-newsletter. Now, on to what I DID with my chocolate. One of mine and Michael's fave spots to get some food in this city is Heartland Brewery and, at their Union Sq. location, they have a dessert they call "Ole Time S'mores" and I was SUPER into it. But, I don't get down there very often these days, and other locations don't seem to have that dessert. So, I thought to myself...why not just recreate it? And I did! 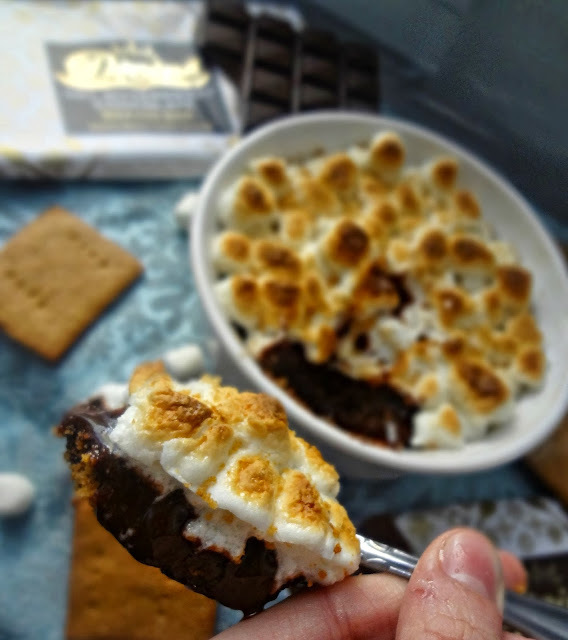 This deep dish s'more is, sort of, single serving. The perfect birthday dish means you don't have to share. First I made a nice thick, buttery, graham cracker crust. Then, the main component, a smooth, rich, thick chocolate ganache I made using half milk and half dark Divine chocolate (giving the perfect balance, methinks), and then a beautiful top of toasted marshmallows. 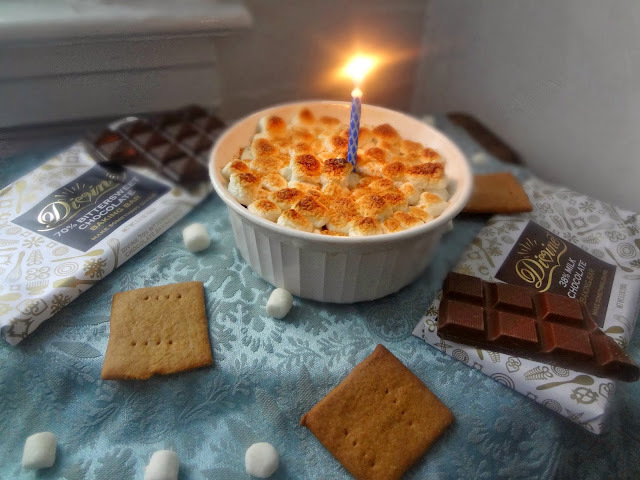 Ahhh...definitely my kind of birthday dessert. ...then again...most people don't make their own birthday treat do they? I'm weird. HAPPY BIRTHDAY TO ME AND MY WEIRDNESS! HOORAY FOR S'MORES AND CHOCOLATE AND KAYLE!!! Preheat oven to 350 degrees. Grease a 16 oz. container (I used this one ) with nonstick cooking spray. In a food processor (or possibly a blender) process graham crackers until finely ground. Scoop out a small handful and set aside. Bake 7 minutes, or until fragrant and set. Cool completely. In a heatproof bowl combine broken up chocolate pieces and heavy cream. Microwave on high for 45 seconds. Whisk until smooth and melted-if needed, return to microwave and heat in 20 second intervals. Shouldn't need more than 1 minute or so. Pour into the cooled crust. Let sit until the chocolate has reached room temperature. Once it's reached room temperature, refrigerate for at least an hour, or more. 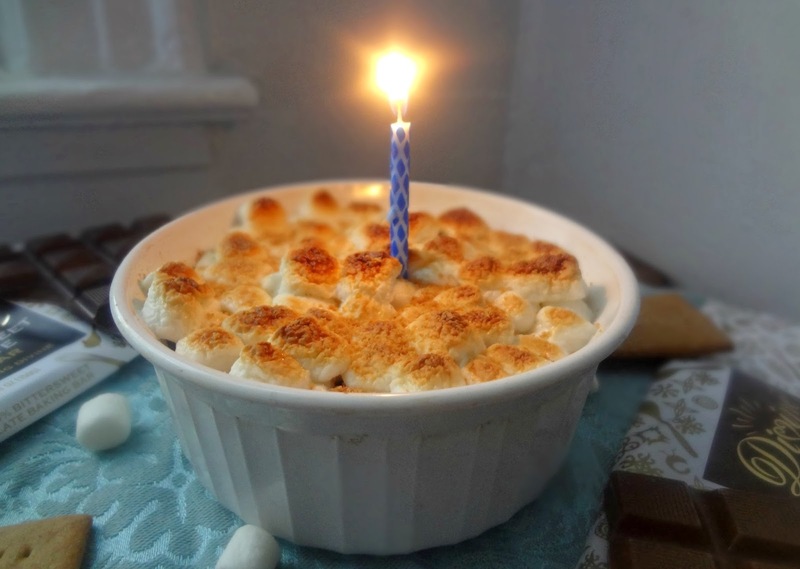 Cover the top with mini marshmallows. Sprinkle with a little bit of the reserve graham cracker crumbs. Leftovers can be stored, covered, in the refrigerator for up to 1 week. and now, to celebrate my birthday, I've got a gift for YOU! congratulations Monica, Lori, and Denise! Giveaway closes November 20, 2013, 12 AM EST. After the contest is over, I will send the winners an email (so please make sure you provide an email address or some other way to get in touch with you), and obtain shipping information (we do not share this information with anyone). The winners will have 3 days to respond or another winner will be chosen, all prizes will be awarded. The winner will be chosen via a random number generator. Divine Chocolate is responsible for delivery of the Gift Sets. Open to U.S. residents over the age of 18. NO PURCHASE NECESSARY. 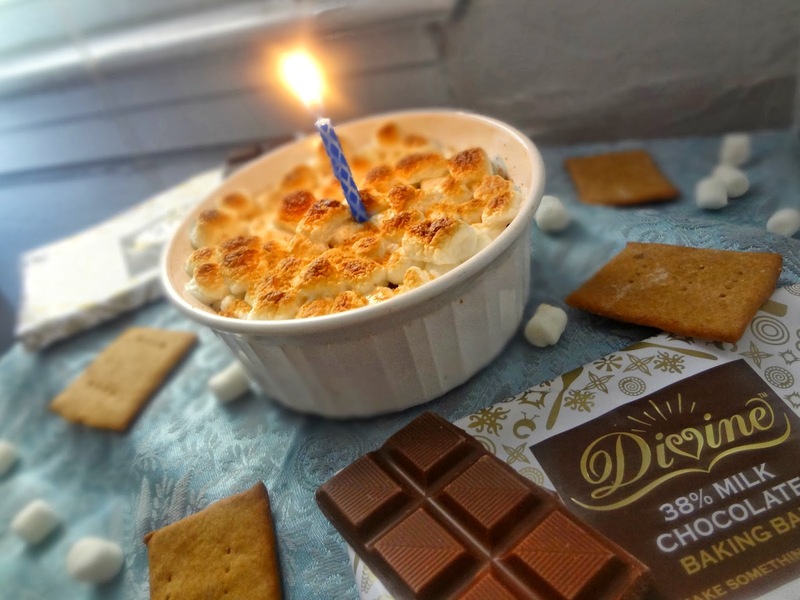 Visit Divine Chocolate's website and tell me-which kind of chocolate are you most excited to try OR what would you do with all that chocolate? Sign up for the Divine Newsletter-leave me a comment telling me if you did. 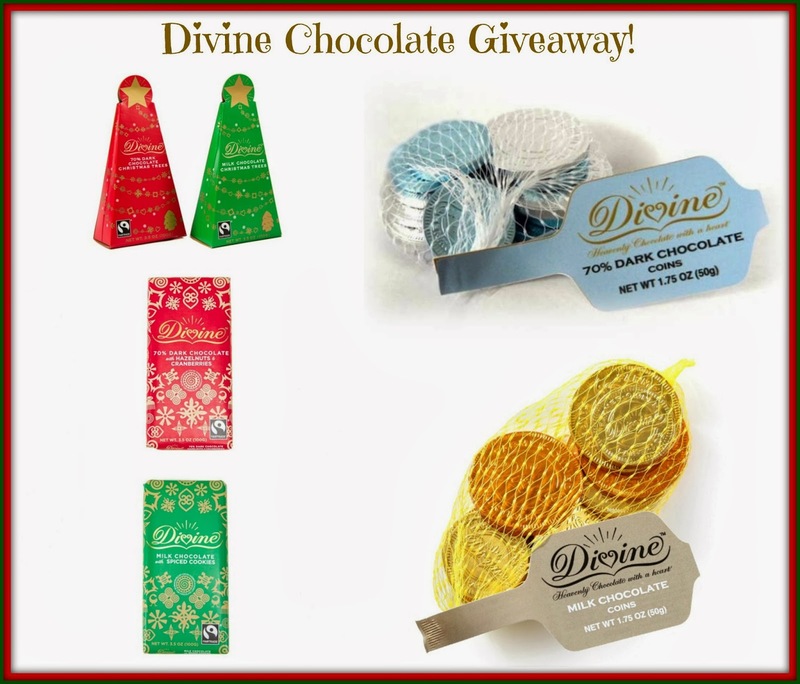 "Like" Divine Chocolate USA on Facebook and leave the comment "I’d love to win Divine Chocolate holiday treats! Sent by The Cooking Actress #DivineInNYC"-leave a comment on here letting me know. Follow @DivineChocUSA on Twitter-leave a comment tell me you did. Disclaimer: Divine Chocolate provided me with product, and I was under no obligation to review if I so chose. Nor was I under any obligation to write a positive review or sponsor a product giveaway in return for the free product. My opinions, as always, are all my own. This post contains Affiliate links. We are not liable for technical failures or typographical errors, or resolving identity disputes related to the winner.VOID WHERE PROHIBITED BY LAW.